Now I do have some hope.....Christine and Erika came over to consult us on our 3-year-old Labradane, a rescue dog, who got thrown into our spoilt rotten life of our two Lab girls.We are willing to give what it takes to ensure that this fearful and growly dog can enjoy being a dog and part of the pack, but decided that we need to get professional advice how to do it right and furever. I loved the package Christine and Erika left after a 2.5hr eval, the options they offered to proceed, and most of all that their approach made my fiancé agree to keep trying to teach this (inside goofy) doggy how awesome life can be with humans and doggy sisters. Very professional, knowledgeable, and obviously experienced in evaluating challenging dog pack dynamics with fearful and thus protective dogs! 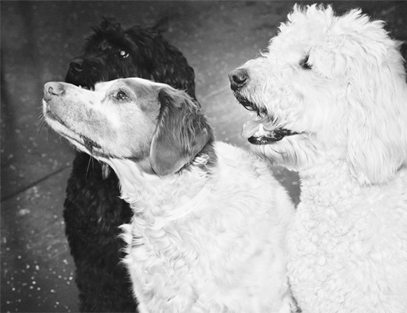 See you soon at in-home and back to basics training with Woody, Izzy and Lucy!